How to draw Anime girl face front view. In this tutorial, you will learn how to draw a girl face in Anime Style. This should be easy for every artist to follow. If it is a bit too fast for you, press pause. Then you can keep drawing along. You will find video tutorial on the top. You can scroll down further to see step by step images with instruction. I finally get some times to get around to post step by step drawing tutorial on this. MORE step by step still images tutorial on Front view anime face. Here is a drawing for Anime girl frontal shot. And now I am going to explain how I sketch step by step. I will try to make this one as easy and simple drawing as possible. Easy tutorial! Let’s begin! 2) Then I add a triangle shape in middle of the bottom to make a chin. 3) Then draw a horizontal line to divide the circle in half. This horizontal line would be where humans eyes should be, they are usually right in the middle of the face horizontally. And the vertical line that where the nose and lips should line up in relation to the face. 5) After I have all the important facial feature mark, I go in and tighten up the line drawing. Also I add in her relatively large pupils. 6) At this stage I begin to draw hair line starting from her forehead. 9) The top of the head should be additional half a circle tall, measure from the top of the existing circle. 10) Almost there! at this stage, I just look at the overall proportion and check if it’s ok to finalize the sketch then I add a slim neck and shoulder. 11) It looks ok, then I clean up the construction lines. Done! Now you have anime or manga face sketch. From here, you could tighten up the drawing more or you can go into coloring you Anime face in Photoshop or whatever you prefer. Clean up and tighten the line drawing and Done! 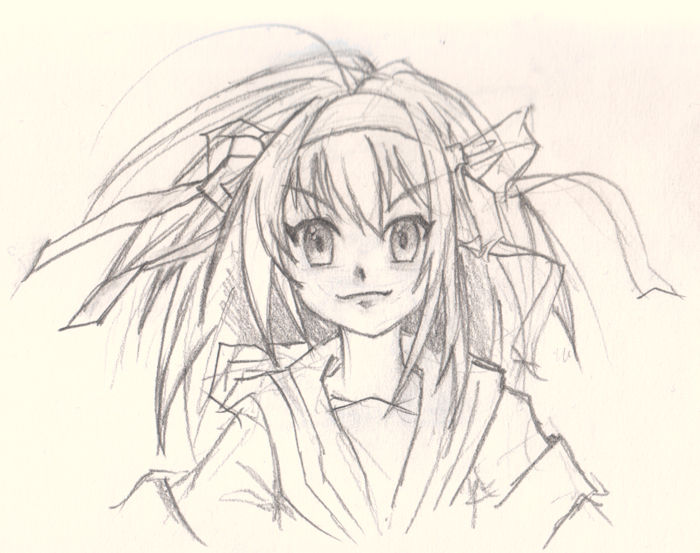 So…hum…it’s a good drawing but…Isn’t that Harui Suzumiya ? P.S. : There’s no escape I’m a Haruist I know my god when I see her ! This has helped me so much! I just started to learn to draw a couple days ago, and I’ve been using this guide as a reference for my front-facing sketches. Thanks for posting it! hey first of all thnx for the great Tut once again, I just started drawing altho a bit late but recently i found more and more pleasure in it , altho im still pretty bad.